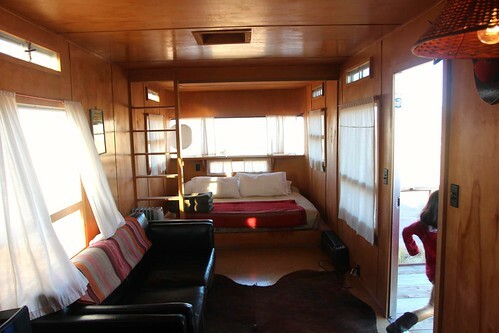 Mali Mish - Day 192: The El Cosmico in Marfa, Texas. 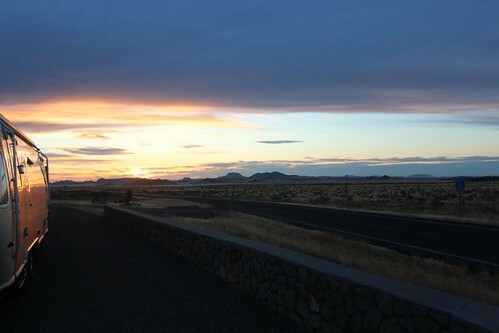 But on the bright side, I was able to get some beautiful photos of the sun rising in the east across the expansive horizon here in west Texas. The wind finally subsided just before dawn and I took the camera out to the road and got lots of photos of our surroundings. This is such a beautiful place to spend a night. I wish I could recommend it to others but I just won’t knowing that you might come across the same overzealous highway patrol imbeciles that harassed us last night, I just can’t do it. As this place is called Point of Rocks Roadside Park, there is naturally a giant pile of rocks here. 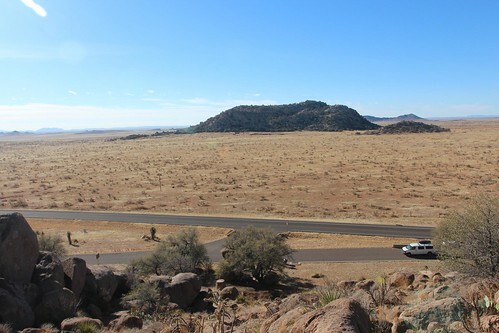 The views are fantastic and this photo gives you an idea of how expanse the views are here in west Texas. 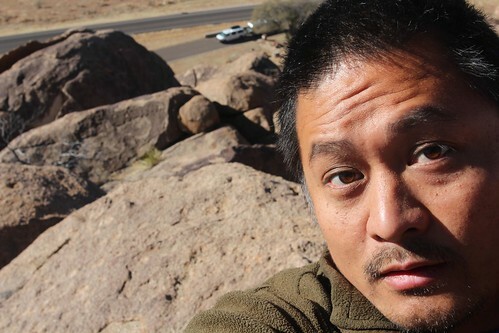 Yeah, someone had to climb up the rocks to get these photos. That person was me. And boy do I need a hair cut. We don’t do a ton of hiking and climbing since our kids are still young. They are just starting to get to the age where they can handle a half mile hike without too much complaining. 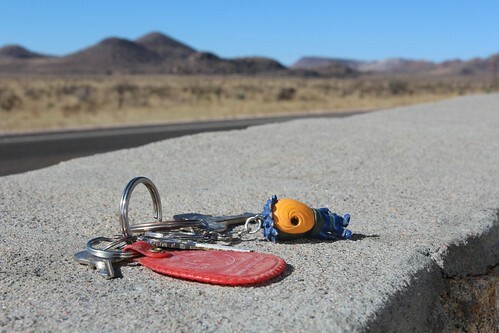 If you have been to Point of Rocks Roadside Park, you might have left your keys there. If it looks like this, I left it there for you. 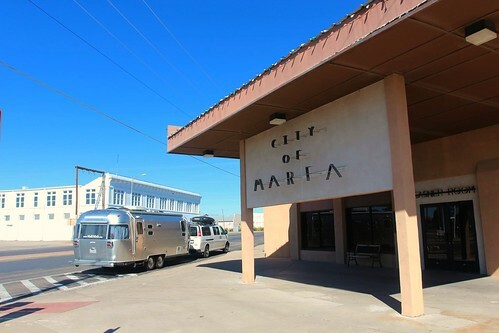 About 20 miles south of Point of Rocks Roadside Park is the small, eclectic town of Marfa, Texas. 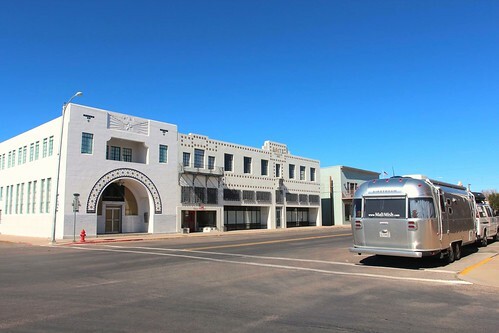 Marfa is known for a couple of things. One of them is the strange dancing lights that appear out of no where in the middle of the desert at night. No one has a perfect explanation of what they are and why they are there. Some records of sightings date back well into the 1800s. 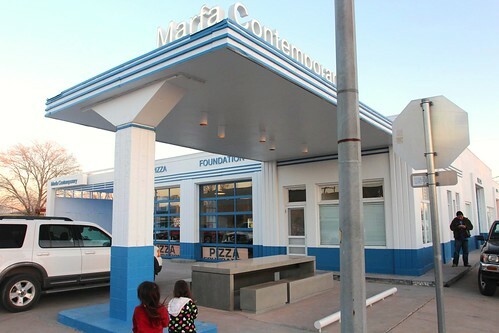 The other thing Marfa is known for is its thriving art scene. It is a very unlikely place for artists to flock to from all corners of the world but for some reason, they are all here. 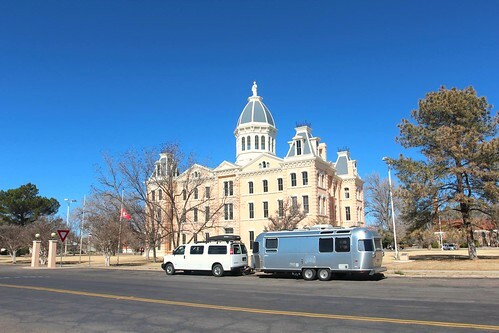 We are here on a Sunday and Marfa is definitely a Friday and Saturday town. Everything felt deserted and vacant. 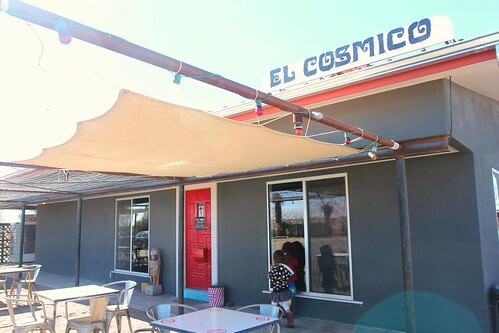 After a few passes up and down the neighborhoods of Marfa, we made our way to the south end of town to visit a neat little place called El Cosmico. 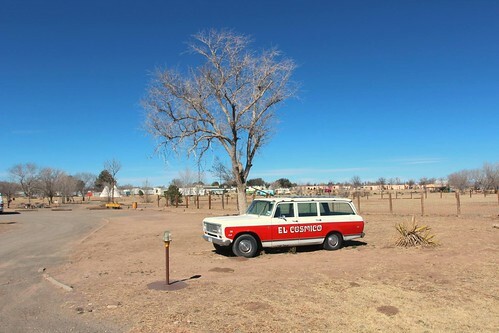 If you have never heard of El Cosmico, it is akin to places like The Shady Dell in Bisbee, AZ, Shooting Star Drive-In in Escalante, UT and Hicksville in the California desert. 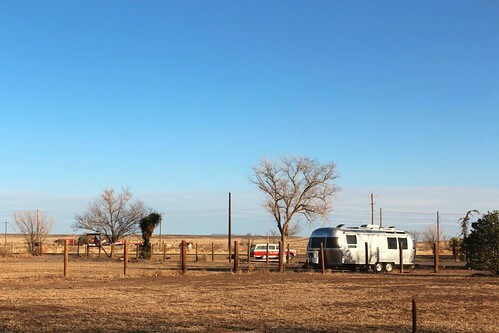 Just like those other fun and unique places, El Cosmico is a hotel made up of unique places for their visitors to spend the night. 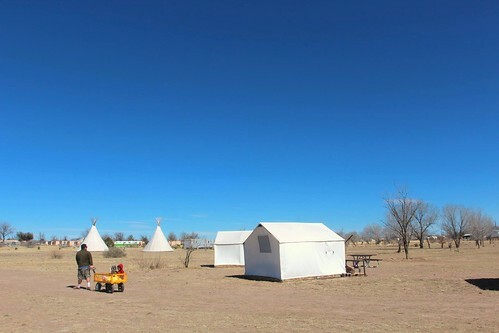 Here you see some of their canvas tents and teepees on their property. 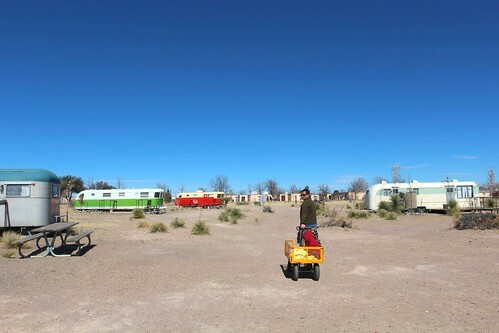 Of course we are here because of their collection of awesome vintage trailers that they rent out to their visitors. 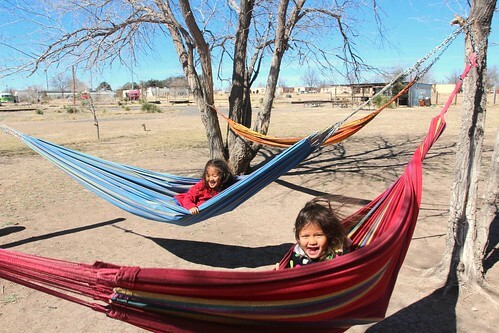 It was still a little cold here but among a cluster of trees on their property are a handful of very comfortable hammocks to take mid afternoon naps in. 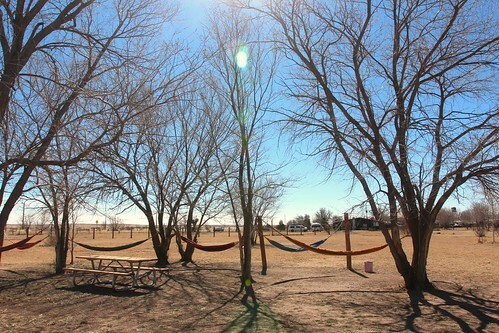 Even though El Cosmico does not have any hook up RV sites, they do have a lot of open space. 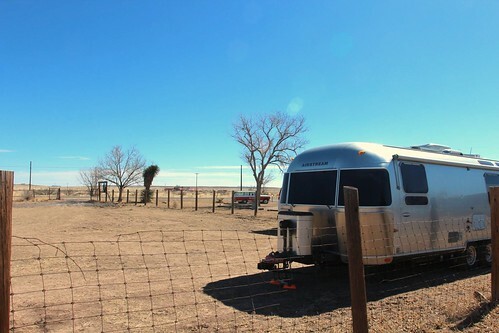 We were able to park inside an acre of land that is fenced in for just $12 per adult. Since our kids were little, they got to ride for free. This is their lounge inside the lobby. Lots of comfortable couches to relax on. 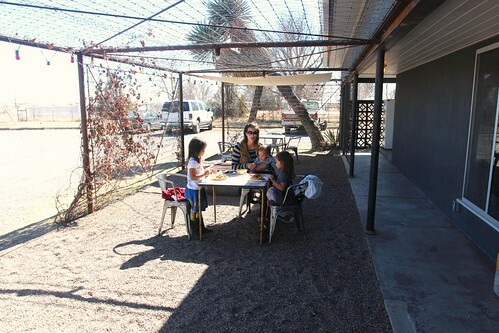 Just outside the front door, we brought our lunch made in the Mish and ate at on their patio. Since the wild winds were gone, the weather was perfect. 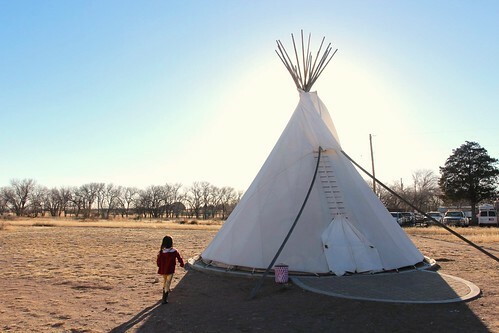 We spent a lot of our time roaming around their property checking out their unique and fun overnight facilities. 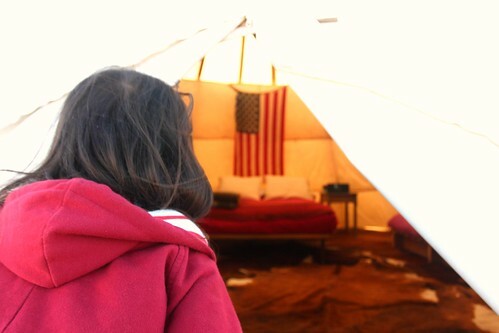 Ava got to peek inside one of their teepees. This would be a really cool place to spend a night or two. 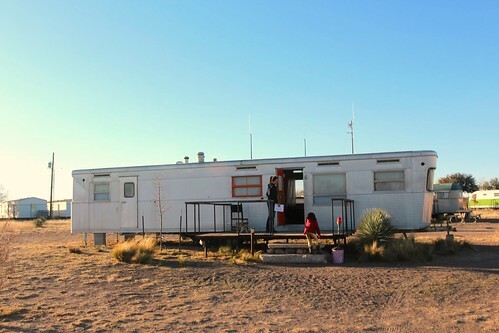 There is an outdoor kitchen, complete with a community fridge that the visitors can come and use as they please. BBQ grills are also provided for a cook out if that is what you are looking for. Even though we are just out in the empty field, there is one 15 amp outlet near the corner of the lot closest to the lobby. We were able to plug into it with their permission so we didn’t have to worry about our solar panels not giving us enough charge throughout the day. 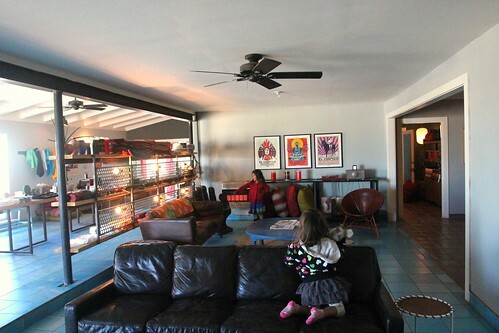 Marlene and Ava even got to see the inside of one of their vacant Spartans for rent. 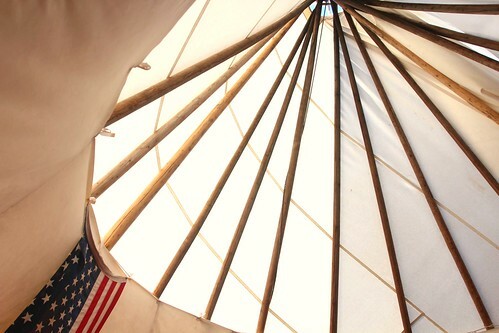 Wouldn’t you rather stay here than a boring hotel room? Because it is a Sunday, there are not very many places still open for dinner in town. 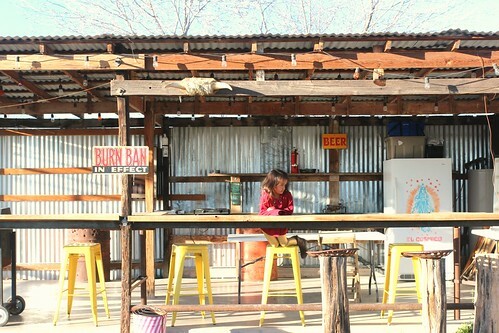 We had driven by this gas station turned pizza restaurant earlier and we asked the lady at El Cosmico about it. She told us that if we wanted to eat there, we needed to call to make sure that they didn’t run out of food. Luckily for us, we called just in time and got dibs on their last piece of pizza dough. 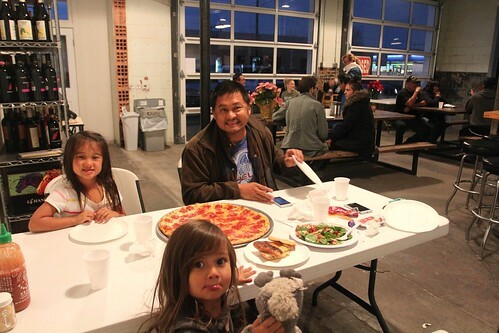 If this looks familiar, that is because just about 100 days ago, we ate at another gas station turned pizza parlor in Louisville called ‘The Garage’ with our friend Carrie. What are the odds, right? 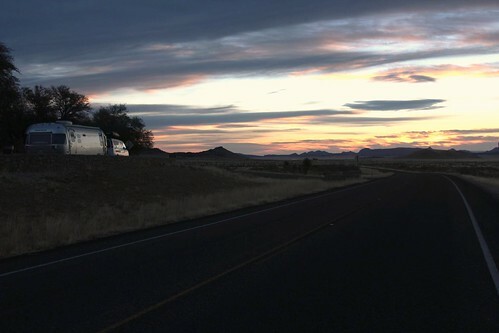 4 Responses to Day 192: The El Cosmico in Marfa, Texas. We ate at the same pizza place too! It was goooood. If you need to do laundry while you’re there — there’s a laundromat/coffee shop close by there! Oooh I love the Spartan. Glad to see you are recovering from the wake up call with the you know who. I feel for you, but now your better and that will be behind you as you step on the gas pedal. Looks like an interesting place to spend a day or two. The sky is so blue! I live in pasadena so we have smog and the sky is only blue like that on windy days. I love it when people convert gas stations into restaurants or stores.